The Alawite State (Arabic: دولة جبل العلويين‎‎, Dawlat Jabal al-‘Alawiyyīn, French: Alaouites, informally as État des Alaouites or Le territoire des Alaouites) and named after the locally-dominant Alawite Shi'a sect, was a French mandate territory on the coast of present-day Syria after World War I. The French Mandate from the League of Nations lasted from 1920 to 1946. The Alawite State bordered Lebanon on the south; the northern border was with the Sanjak of Alexandretta, where Alawites made up a large portion of the population. To the west was the Mediterranean. The eastern border with Syria ran roughly along the An-Nusayriyah Mountains and the Orontes River from north to south. The modern Latakia and Tartus Governorates roughly encompass the Alawite State. Both have majority Alawite populations; parts of modern-day Al-Suqaylabiyah, Masyaf, Talkalakh and Jisr ash-Shugur Districts also belonged to the state. The collapse of the Ottoman Empire at the end of World War I (with the Armistice of Mudros on 30 October 1918) brought on a scramble for control of the disintegrating empire's provinces. 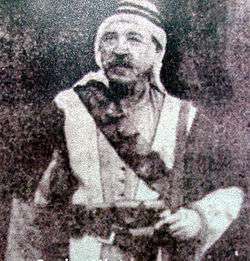 As of 1918 France occupied Lebanon and Syria, which was under the leadership of the Amir (Emir), Faisal I. By 1920, growing anti-French sentiment in the region led to the establishment of the Arab Kingdom of Syria under King Faisal I on 7 March 1920. The Arab Kingdom of Syria was initially supported by the British, despite French protests. The British withdrew support, and on 5 May 1920 the Allied Supreme Council published a Mandate for "Syria and the Lebanon" to the French Republic with French and Arabic the official languages. General Gouraud was appointed high commissioner of the Syrian territories and commander-in-chief of French forces. In 1930 the Alawite State was renamed as the Government of Latakia, the only concession by the French to Arab nationalists until 1936. 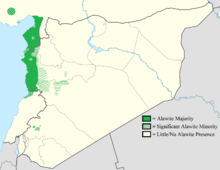 On 3 December 1936 (becoming effective in 1937), the Alawite state was re-incorporated into Syria as a concession by the French to the Nationalist Bloc (the ruling party of the semi-autonomous Syrian government). In 1936, the Palestinian Arabs began a three-year revolt. While some trade with Jewish merchants was uninterrupted, pan-Arab sentiment in Syria and ties "of kinship, culture, and politics" resulted in the extension of support to Palestine. In addition to pro-Palestinian strikes and demonstrations, Syrians smuggled arms into Palestine and led successful guerrilla groups. By the end of 1938 the French government "no longer found it advantageous to allow Syria to continue as a base for radical pan-Arab activities, in particular those associated with the revolt in Palestine", and it cracked down on Syrian nationalism. As a result of the Syrian civil war, speculation exists on the possibility of reprisals against the Alawites leading to the re-creation of the Alawite State as a haven for Assad and government leaders if Damascus falls. King Abdullah II of Jordan has called this the "worst-case" scenario in the conflict, fearing a domino effect: fragmentation of the country along sectarian lines, with region-wide consequences. 1 2 3 4 5 6 7 8 Provence, Michael. "The Great Syrian Revolt and the Rise of Arab Nationalism." Austin: University of Texas Press, 2005. 1 2 3 4 5 6 7 8 9 10 11 12 13 14 15 16 17 18 19 Khoury, Philip S. "Syria and the French Mandate: The Politics of Arab Nationalism, 1920-1945." Princeton: Princeton University Press, 1987. 1 2 3 4 5 6 7 8 9 10 11 Longrigg, Stephen Hemsley. 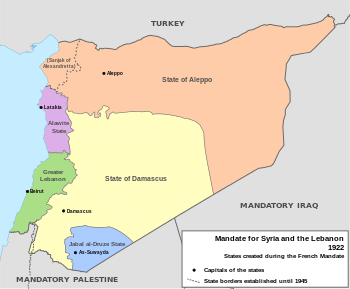 "Syria and Lebanon Under French Mandate." London: Oxford University Press, 1958. 1 2 Burke, Edmund, III. "A Comparative View of French Native Policy in Morocco and Syria, 1912-1925." Middle Eastern Studies, Vol. 9, No. 2: 175-186. May 1973. 1 2 3 4 5 6 7 8 Rabinovich, Itamar. "The Compact Minorities and the Syrian State, 1918-45." Journal of Contemporary History, Vol.14, No.4: 693-712. Oct 1979. 1 2 3 Khoury, Philip S. "Factionalism among Syrian Nationalists during the French Mandate." International Journal of Middle East Studies, Vol. 13, No. 4: pp. 441-469. Nov. 1981. ↑ Shambrook, Peter A. "French Imperialism in Syria, 1927-1936." Reading: Ithaca Press, 1998.